Would you like contacting if or when microwave-crisper becomes available again?" 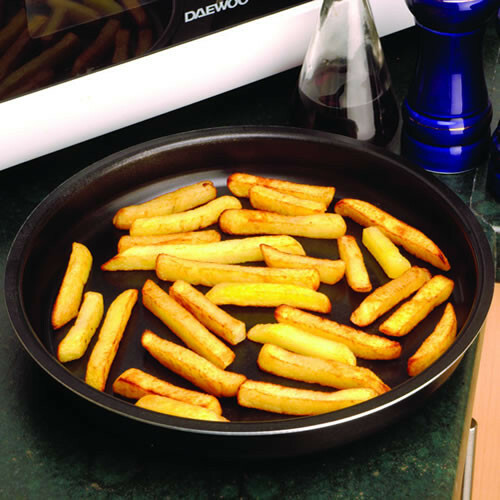 Microwave crisper is a 25cm (10in) metal plate you can use in your microwave. A clever none stick coating makes it safe. You put your microwave crisper in your microwave oven for a couple of minutes and it gets very hot. You are ready to add your chips, and cook them fluffy on the inside crisp on the outside in about 6 minutes flat. You can at last fry an egg in your microwave, and enjoy crispy bacon. Crispy based pizza is ready in microwave time, as are meats like steaks, chops and fish. Microwave crisper will make you rethink how you use your microwave oven as you get the speed and the crispy crunchiness you want. Microwave Crisper text, images and video are copyright.